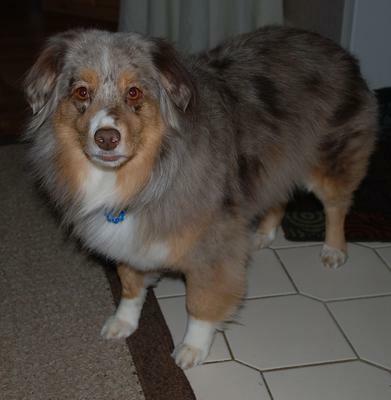 This is my female Mini Aussie Gabby, she is a darling. She will let me know when it is time to eat or time to have her treat. When she wants to go out, she rings a doggie door bell to let me know she wants to go out or sit up pretty and stare at me until I get up an let her out. Her other ways of communicating what she wants is to place her head in my lap and stare—she has me trained. She will come and get me when it is time for me to eat. My wife tells her to "go get daddy" and she will run and get me.